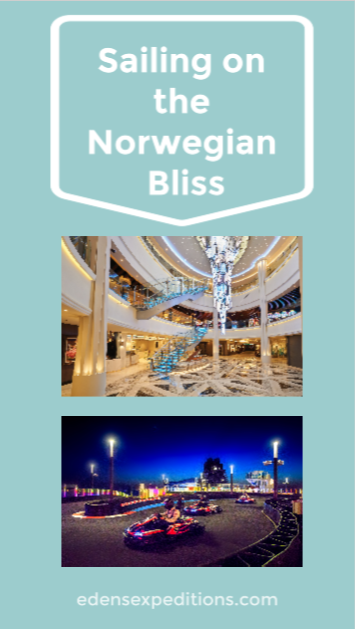 During the springtime, my family and I hopped on board the Norwegian Bliss cruise ship. 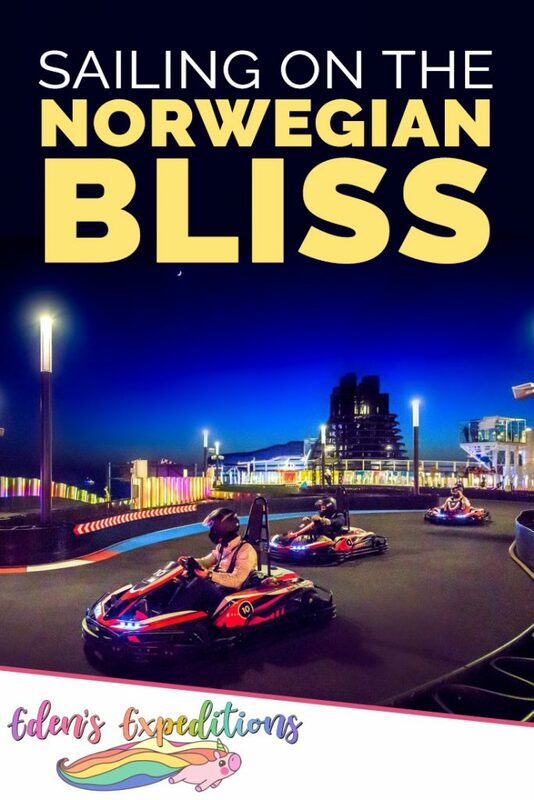 The Norwegian Bliss is a large ship with plenty of attractions for all, including go-karts, laser tag, a spa, multiple pools, hot tubs, waterslides, and lots of different restaurants. The overall experience was amazing and fun. I would gladly partake in another voyage on the Norwegian Bliss. It did not take long to board the ship because we were placed in one of the first few boarding groups. We took an escalator to the second story of the building that we had been waiting in and proceeded to stroll up the boarding ramp behind many eager passengers. At the end of the ramp, staff members wearing leis and big smiles scanned our room keys and gave us hand sanitizer. My family and I walked through the doors, entering the great Norwegian Bliss, and I was straight away in awe of just how much you can fit on a cruise ship. The concept of a cruise ship is crazy to me, and I love it for everything it is. This is the second cruise that I’ve ever been on, the first of which being a Disney Cruise on board the Disney Dream. When we entered our stateroom we were happy to see that there was a queen sized bed, as well as a couch that turned into another small bed. Housekeeping also pulled a bed down from the ceiling, forming bunk beds. We had a t.v. and a balcony that was just below the Ocean Loops water slide. There were plenty of plugin outlets, and we were happy with it, although it was a bit small. After riding the elevator up to the proper deck and dropping off all of our luggage at our stateroom, we hopped right back on the elevator and ventured to the pool deck. It was a very mild morning in this part of California. If it weren’t for the sun shining on the pool deck, it might have been a teensy bit chilly. The cool breeze was enough to assure me that I didn’t want to go swimming straight away, although the water slides and nearly empty pools were kind of convincing. The pool deck is large and spacious and has just about everything you would expect and need. There were plenty of chairs for everyone, although there was a much smaller number of people on deck than the average cruise (This was the inaugural sailing). Very close to the pool deck are a few restaurants to satisfy your needs, and next to each of the pools, hot tubs, and water slides is a shower that you can use to rinse off before and after you swim. The ship holds two saltwater pools. Some would consider this a plus because salt water is apparently known to be good for your skin, but I sit on the other side of things. My skin is very sensitive, so the salt water wasn’t the most pleasant. I also couldn’t go swimming beneath the water because the salt would make my face burn worse than my body. This is more of a personal complaint, although I think it’s important that others don’t make the same mistake that I did. One of the pools is slightly heated, while the other is nice and cold. 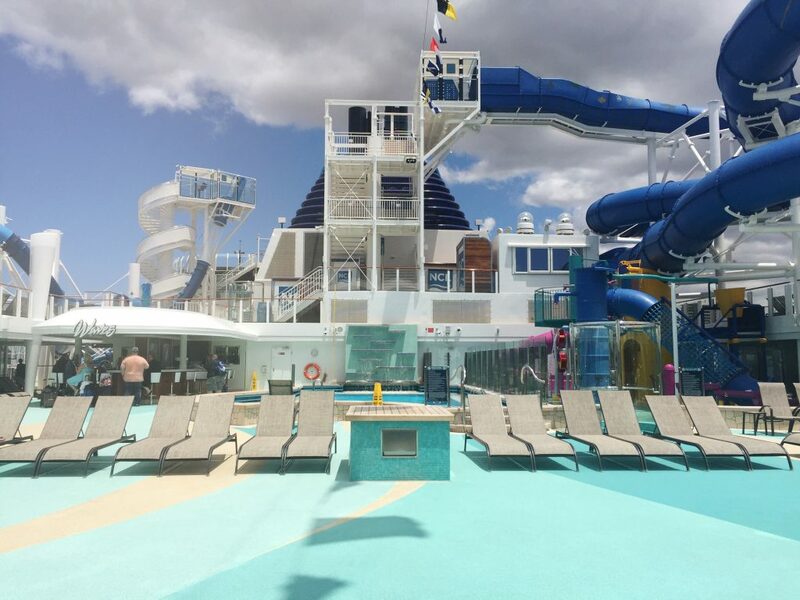 Throughout the cruise, I saw a number of people enjoying both the hot and cold. My family preferred the hot tubs because the weather remained pretty much the same throughout the cruise (Cold, but not really cold, and warm, but not really warm). There are several hot tubs on the ship, although I cannot remember the exact number. None of them were very big, and they were usually occupied, so you either have to get comfortable with strangers or wait until a group of people clears out of the hot tub. Luckily, my family didn’t have much of a problem with this. 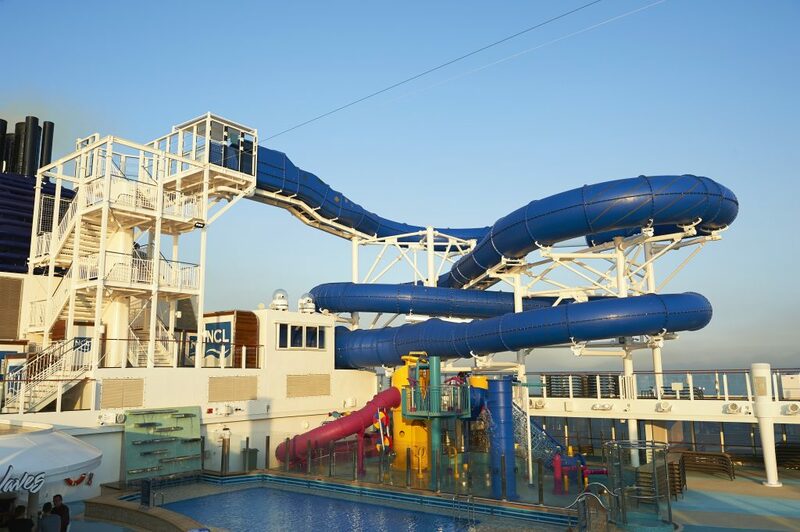 There are two different water slides on board the Norwegian Bliss. One of those is called Ocean Loops. It’s one thrilling water slide that starts out by dropping the floor from beneath your feet and sending you straight down. You fly through several loops, and if you don’t have enough momentum to make it all the way through, there are a few different hatches that you can use to exit the slide. At first, I didn’t realize there were these emergency hatches. I became very worried when I saw someone fail to make it through a loop and start sliding back. I thought they would be stuck in the slide, hanging over the ocean with no escape. I was particularly confused that nobody else seemed concerned. Unfortunately, I never had the time or confidence to give this slide a go. It looked extremely fun, but it also looked terrifying. Tucked into the corner of the pool deck is the Kids Aquapark. It holds a splash pad and a set of play structures that lead up to a small water slide. All of it is very colorful, and I can honestly say I would have tried it if only I were a few years younger. On the level just above the pools and the Kids Aquapark is another large water slide. 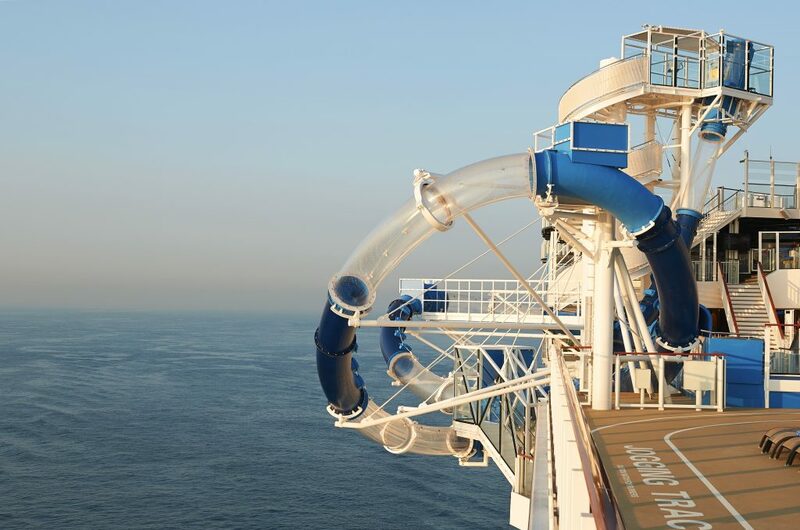 It’s a tube slide where you and someone else can race alongside each other. I can’t say much about it because I never had the time to try it, but it does look like a lot of fun. There were plenty of happy squeals and screams coming from the waterslide, as well as smiling faces for those exiting the ride. 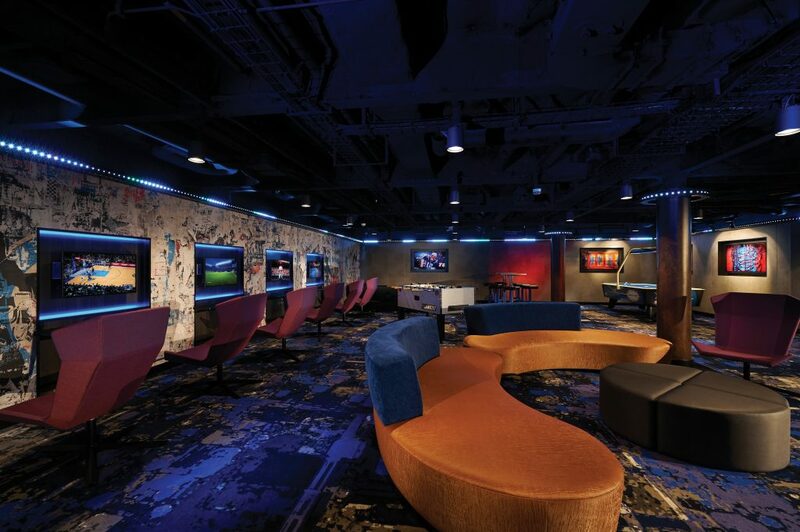 The Norwegian Bliss cruise ship has both a teen club and a kids club. They’re good places for kids to get together and hang out while the adults are off doing other things. There are some other fun activities as well, such as laser tag and go-karts. 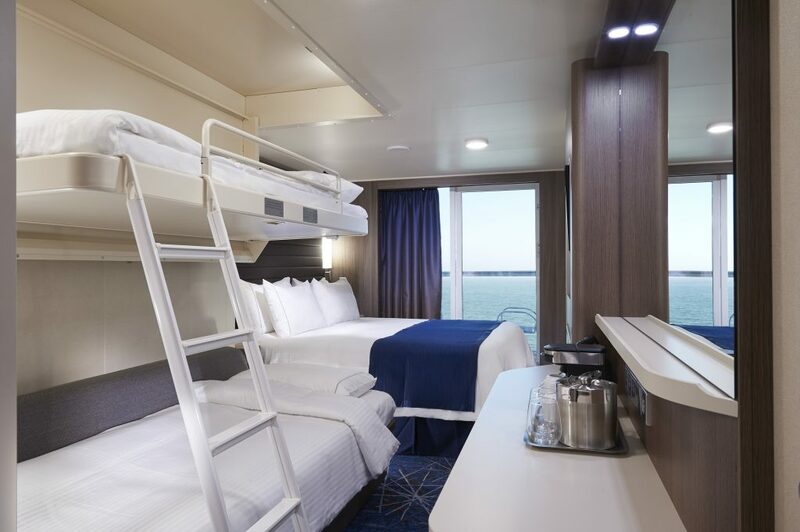 The teen club aboard the Norwegian Bliss goes by the name of Entourage. I believe you have to be between the ages of 14 and 17 to get in. It holds multiple stations for playing video games and a number of different game options for both Wii and PlayStation. I’m sure any video game loving teen would have themself a good time. There’s also a foosball table, air hockey, board games, karaoke, and comfortable furniture. I especially enjoyed winning at Connect Four, but I’d rather go to the arcade or partake in other activities. My brothers and I visited Entourage a number of times, but there weren’t ever people there because it was the inaugural sailing. My brothers and I were some of the only kids on the ship. I’m sure some company would have made the teen club more fun, but I can’t really complain under the circumstances. The kids club goes by the name of Splash Academy. It too has a large number of video game options and board games, similar to the teen club. Of course, I did not spend any time there myself, but it’s incredibly large and spacious. 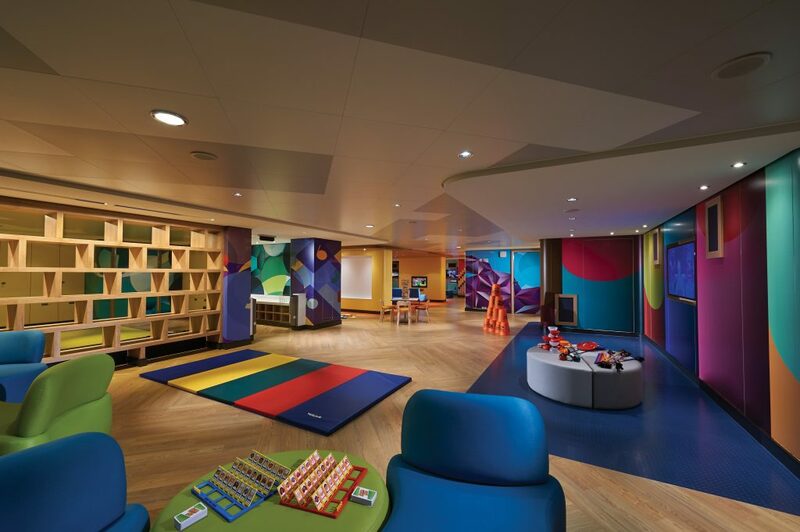 It’s also very colorful and appears to be the perfect space for younger kids. I also believe there is a space called Guppies for toddlers and much younger children. Just beyond the waterslides and up a set of stairs, you can find a decent sized go-kart track. Containing turns and bends, it is plenty of fun to race through. People can watch and film from the sides of the track. You can reserve spots to ride the go-karts using one of the screens that can be located in and around the ship. The go-karts, and the track itself are fairly nice. 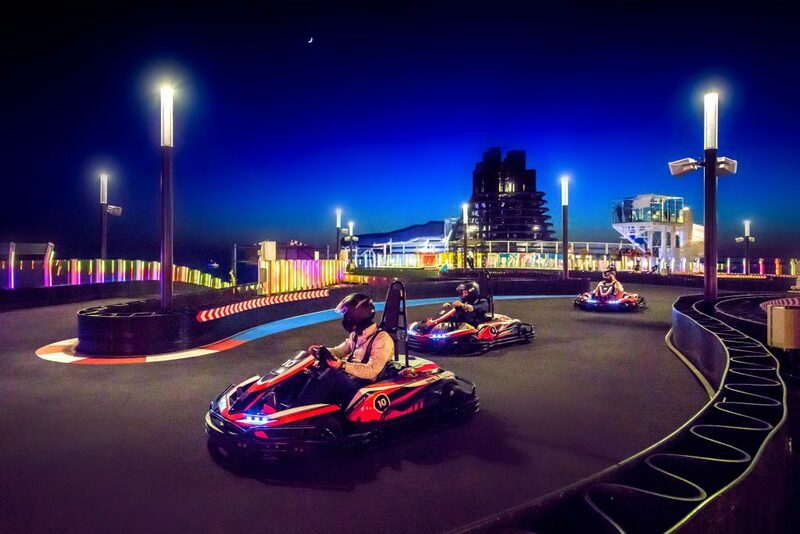 Of course, the Norwegian Bliss is a very new cruise ship, therefore the karts are all in very good condition. They make for a very smooth, fast ride unless you’re me. The go-karts are simply so fast and sensitive that I had a hard time maintaining control. I was very hesitant to hit the gas all the way, and it took me multiple laps to get a hang of it. This is coming from a person who isn’t particularly bad at go-karts. Yes, I was embarrassed to be watched by so many people hanging out on the side of the tracks, but once I got things figured out, the ride was great. My brothers, on the other hand, sped through the track without using the breaks once. Zero hesitation, lap after lap. They had an absolute blast. 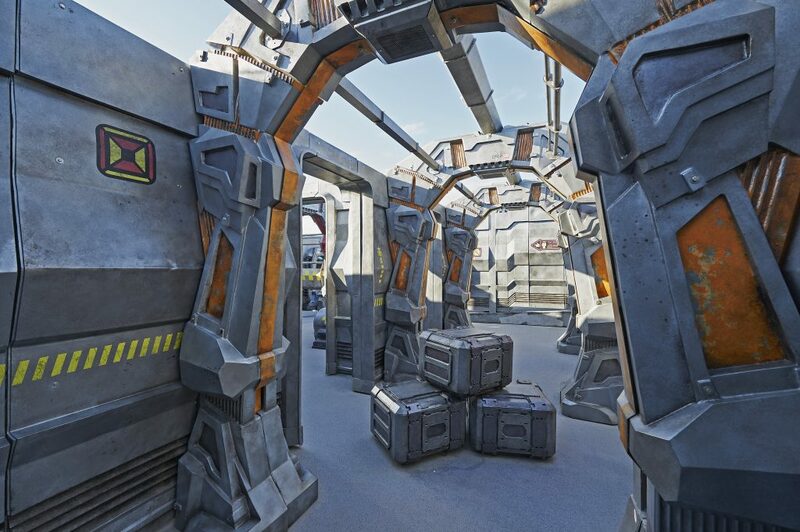 You can find the laser tag arena on the complete opposite side of the ship from the go-karts, and up multiple staircases. There’s a great spot to take photos on your way up the stairs, both of the ocean and of the pool deck. You can reserve spots for laser tag in the same way that you reserve spots for go-karts. Playing a game of laser tag in this interesting arena is a whole lot of fun and entertainment. The employees instruct you on how to operate the different mechanisms on the gun, such as the shield and rapid fire before the game begins. Even if you haven’t played laser tag before, you’ll find it simple and easy. You’re guaranteed to have a good time. My brothers and I played a game with some of our friends. When we arrived for our reservation I was turned away for wearing flip flops. Closed toed shoes are required for laser tag and go-karts, so I bolted down several flights of stairs to our stateroom. I quickly put on tennis shoes and ran back up the stairs because the elevator was busy picking up other people. I had to go outside onto the pool deck and climb several more flights of stairs to make it all the way back up to the laser tag check-in area. After all that, I’m happy to say that my team won. Yes, the teams were uneven, and my team definitely had the advantage, but I don’t care. Please, just wear closed toed shoes. Don’t make the same exhausting mistake as me. Next to the go-kart track is a mini-golf course. You don’t need any reservations, just grab a putter and a ball off the rack and you’ll be good to go. There’s a decent amount of holes, and it’s in a place where you don’t have to worry about wacking your golf ball out to sea. While on board the Norwegian Bliss, I had time to eat at a couple different places. 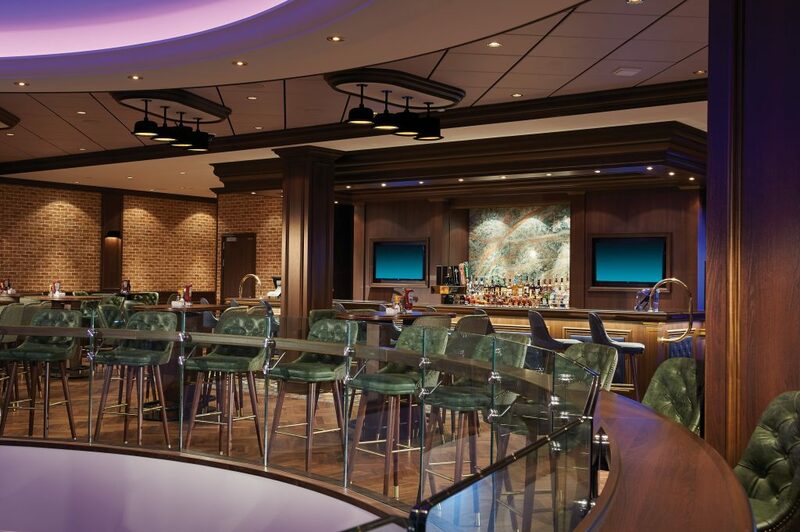 The Norwegian Bliss has plenty of places to grab a bite. There are a number of nice restaurants, bars, and places that serve pub food. 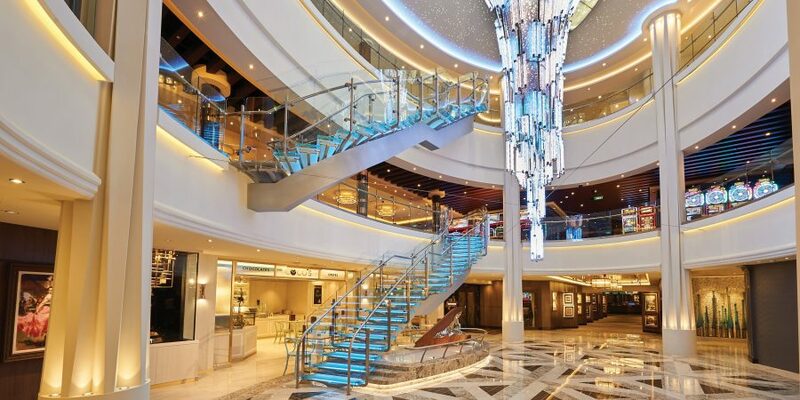 Aside from the sit-down restaurants, the ship holds a Starbucks and a rather large buffet. The buffet is vast and caters to basically everyone. You can feast on anything from pizza to crab. Steaks, roast and potatoes, french fries, burgers, seafood, Chinese food, desserts and a whole lot of other options await those who dine at the Garden Cafe buffet. My brothers stopped by the buffet several times a day, and I can’t blame them. My family and I also ate at The Local Bar and Grill, which is located on deck four. This pub serves up burgers, wings, and other foods that are sure to make you happy. Personally, I really liked their spinach and artichoke dip. Inside, there’s also a bar and seating that overlooks an entertainment area on the lower deck. There are a couple of bowling lanes at the Local. It’s old fashioned bowling, so the balls are much smaller. If you want to give it a try just hop in line. If there’s no line, lucky you. Another great place to eat at while on the ship is The Manhattan Room. 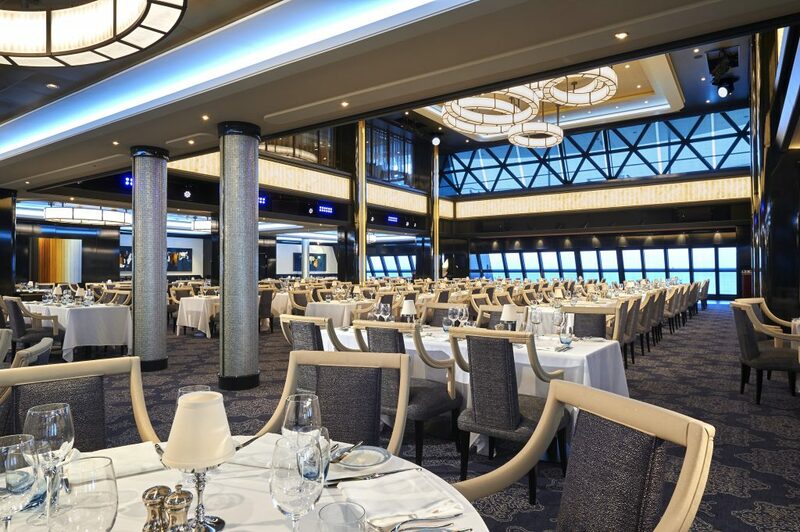 This restaurant is two stories and is in the back of the ship; it can be found on deck seven. Large window panels give you a great view off the back of the boat. Overall, the food is great, and dessert is delicious. I had the opportunity to try the chicken, which was amazing, and the key lime pie and chocolate lava cake off of the dessert menu. I really enjoyed both desserts, but I have to give it to the chocolate lava cake simply because I’m a chocolate lover. Coco’s is a dessert place located midship. 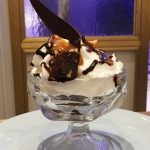 They have a selection of milkshakes, ice cream sundaes, and other fantastic sweets on their menu. It took me a long time to pick what I wanted because everything looked so good. In the end, I found my ice cream sundae to be delicious, although it looked much different and much larger in the picture found on the menu. That’s really the only complaint I have, it’s dessert after all. 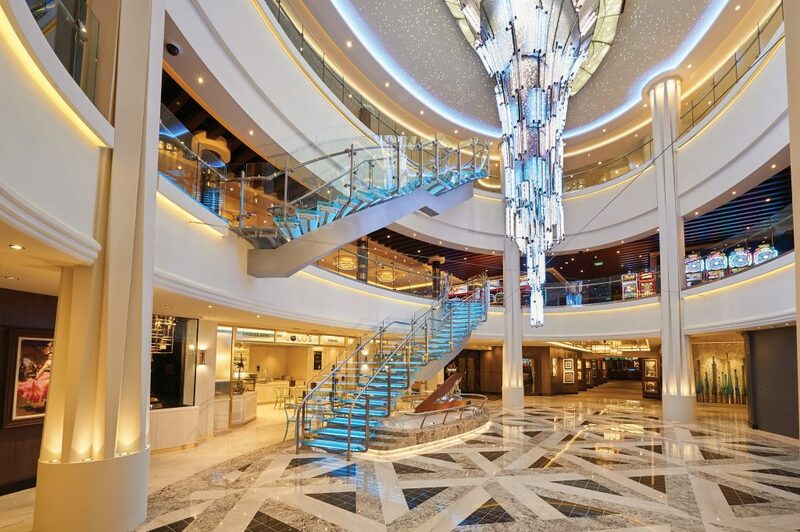 You can also find a casino on board, as well as a spa and fitness center. I never went to any of these, although I did pass through the casino a few times. The only other cruise that I’ve been on aside from this one is a cruise on the Disney Dream, but I think there are a few things to be said about both. Both have ice cream machines, but the Disney Dream has multiple next to the pool. Easy access to ice cream is very important to my brothers and me. Overall, there’s a lot to love about both cruises; the ocean, the food, and the activities. I’d gladly hop on either of these cruises any day. Who wouldn’t? What a fantastic article! I would love to cruise on the Norwegian. Eden is an excellent writer! I felt as if I was experiencing some of the activities as well.